On September 24th, 2018 VMU Centre for Asian studies together with the Komaru Transportation Foundation and Hiroshima University Lithuania Center organized Japanese language contest. Congratulations to the authors of the best speeches Salomėja Jurėnaite and Matas Jagelavičius who won an opportunity to participate in an international Japanese language program on February-March 2019, in Hiroshima University, Japan. 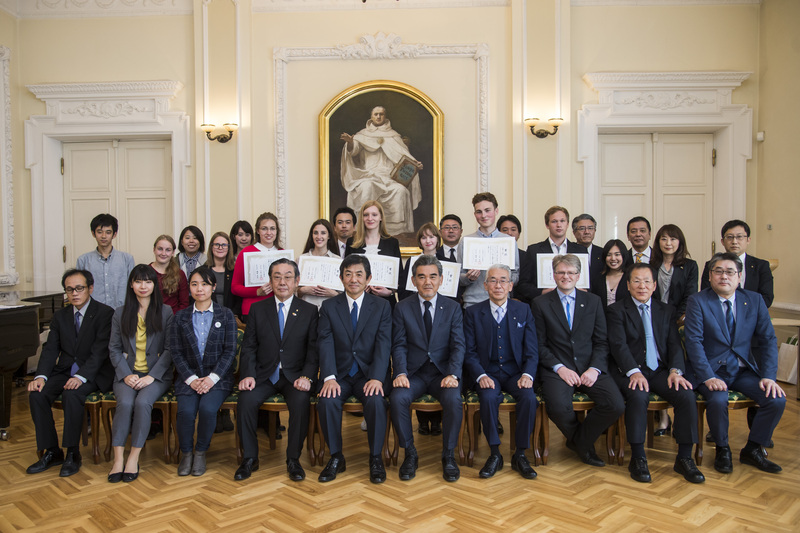 This is the first time that a speech contest like this, organized together with our partners in Japan, was held in Lithuania.The participants of the contest have been divided into 3 categories according to their Japanese language knowledge level and competed for the great prizes provided by the sponsors of the contest. Prizes included i-pads, electronic dictionaries, tea drinking ceremony sets, etc. The contest began with opening addresses by Honorary Ambassador of Lithuania in Fukuyama Mr. Sh. Komaru and Mr. M. Ochi rector and president of Hiroshima University. Furthermore, the new Japanese Ambassador to Lithuania H. E. Shiro Yamasaki, who arrived directly from the Presidency, where he was confirmed as an Extraordinary and Plenipotentiary Ambassador, participated as well. Participant’s speeches were evaluated by a competent commission brought together especially for this competition and consisted of representatives from the Hiroshima University, Komaru Transportation Foundation, Head of the CAS dr. Aurelijus Zykas and Japanese language lector Ms. Kayako Takagi.